Launched in 1997, Thrombus is the definitive review journal dedicated to thrombosis, anticoagulation and clotting disorders. With a rich blend of clinical review articles, case studies, service developments and research updates, Thrombus is of interest to all members of the multidisciplinary team involved in the prevention and treatment of venous thromboembolism, deep vein thrombosis, pulmonary embolism and atrial fibrillation. 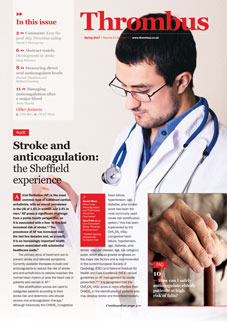 The latest issue of Thrombus is available free of charge in print (UK only) and online, and can be downloaded as a PDF or EPUB to view on your computer, tablet or smartphone. Editor: David A Fitzmaurice MD FRCGP Professor of Primary Care, Primary Care Clinical Sciences, University of Warwick.